A Shelby Mustang GT500 isn't quite radical enough? You need the Mustang Super Snake. Well, if you happen to have an extra $29,495 to $33,495 still burning a hole in your pocket after setting aside the cash to purchase a new Mustang Gt500, you'll be able to spread a little venom around your neighborhood. So what turns a new Mustang into the big snake? It's actually two versions of an ultra high performance upgrade package for the Mustang GT500 which, depending on the buy in, will include upgrades in the interior, exterior and a big bump in the performance of these Shelbys. Most people think that the first year of this potent package was 2007, but the original Super Snake was actually a one-off 1967 Shelby Mustang GT500 built for Mel Burns Ford and was powered by a specially built 427 cubic inch V8. Carroll Shelby drove it at the Goodyear test track, where it ran off laps of 150 mph and peaked at at top speed of 170 mph. Unlike the original's production of exactly one unit, the new model, while still low production, was produced for more to enjoy. 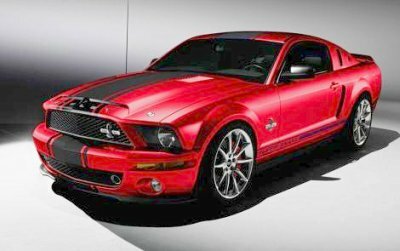 This Super Snake package has been available for the 2007, 2008, 2009 and 2010 models. The links below lead to information on the individual model years and upgrades.